Happy Kitchen Sink Stamps Monday, thanks for stopping by today, I hope you had a great weekend! We had a busy weekend, our youngest turned 16 yesterday, so we has some family and some of his friends over on Saturday for a small celebration. 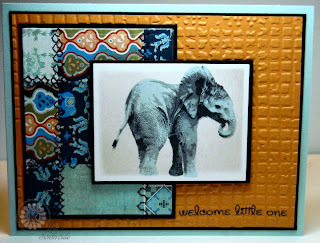 I don't have any friends who are expecting, but thought the Multi Step 'Lil Elephant would make a wonderful Baby Card. I added in some scraps of Basic Grey papers, to create a faux quilt. This would definitely make an adorable baby card, the quilting is perfect with this image. What a stylish and modern baby design, Lisa!! I love it with its sensational textured background and that sweetly stitched patchwork quilt!! Both are great fit for this wonderful baby elephant image!! That DP is perfect with this stamp! Adorable! The faux quilt looks fabulous Lisa! 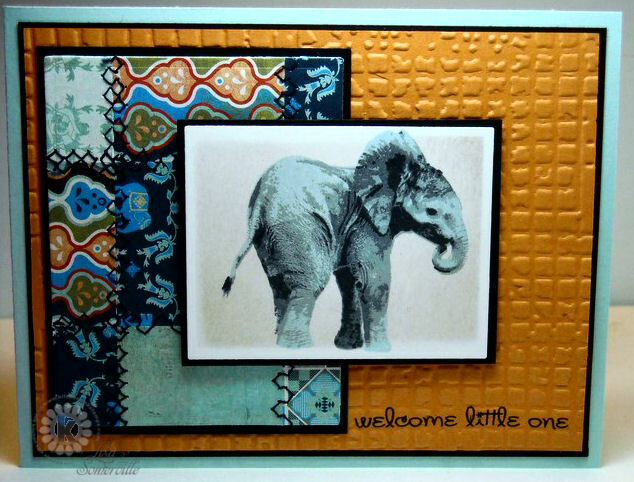 I love the embossed background and the elephant together! I love those elephants. Wonderful design with the paper.